Emergency Exit from Bristol consisted of Jon Klein guitar and main songwriter), Phil Jones (Bass), Paul ‘Fuzz’ Williams (drums) and Mike Stanley (singer).All Cotham Schoolboys (as were the Cortinas)and the object of much derision from fellow Cothamites, future arty-post punkers The Pop Group. Jon went on to join Europeans, Specimen and Siouxie and the Banshees. Mike now lives in Madrid Spain and continues to perform live. Phil and Fuzz got lost in the mists of time unfortunately. Existed 77-78. Made one demo at Steve Street’s studios in Bristol. Stand-out songs were: Platform Shoes, Shampoo, Blind as a Bat. I think there were some Iggy covers in the band’s repertoire. Can’t remember much else. I still have the demos on cassette. No photos. It’s always good to move a band from the “More Information Required” page, this being one of the main aims to make sure as many bands as possible are listed and have the most accurate information. I haven’t spent so much time on the site over the past month, but hopefully over the next couple of weeks I aim to get the remaining countries complete as far as I can, and then maybe add photos to the pages. Back to Emergency Exit! If I may ask, did you, like Jon, move onto any other bands? also do you have a complete tracklisting for your demo and/or an approximate recording date? Hope all is well in Madrid (beautiful city) and thanks once again for getting touch. Thanks for that. Emergency Exit were never going to rival the success of our school-mates the Cortinas, who were local celebrities and deservedly so. We only played a handful of gigs, including the Annual Bristol Biker Ball in 1977 at one of the Polytechnic sites, where I recall we nearly got killed by hairy greasers hurling bottles and glasses. The demo, recorded May-77 had four tracks; shampoo, Platform Shoes, Blind As A Bat and One One One. Jon and I had been friends since we were at Elmlea primary school and playing in bands since we were 14 years old. After he joined Europeans, I went on to form a post-punk ensemble called Total Abusic, which Jon guested in quite a lot. We recorded two demos also at Steve Street’s. Total Abusic gigged a lot in 1980. For dates and Venues, see; http://www.bristolarchiverecords.com/gigs.html. Despite everything we were never approached by local music people. I think we didn’t have the right haircuts, weren’t trendy enough or just didn’t know the right people (tick the appropriate box). 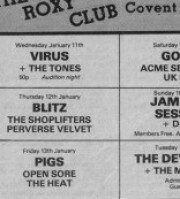 I find it strange that despite our ubiquitousness on the ‘scene’ at the time, there is no mention of us in the short-listings of the aforementioned website, but that probably speaks volumes about the cliquiness of the Bristol scene at the time and probably now too (and maybe also the fact that we were possibly a bit crap). In early ’81, Total Abusic morphed into the Groove Tube (also featuring Jon, myself, Paddy Gigg (ex-Double Vision-drums), Andy Wood (guitar) and Roger Garbutt (ex-No Deposit) on bass , which was another kettle of fish altogether. Leaning heavily on Nuggetts-style late 60’s garage rock, we played two fine very well-received gigs at Trinity Chapel, only slightly marred by a beating from the Barton Hill punks armed with baseball bats. I have some rehearsal recordings of the band, which sound pretty good. We were offered a tour and management deal, but Jon by this time was on the cusp of going to London with Specimen and opening the Batcave and the rest is history as they say. I came to Madrid for the 1st time in late ’81 and returned to settle here permanently in 1984. Mike Stanley’s Free Radicals, released ‘Pretty Ghost of the Truth’ in (2005) on Several Records. ‘The Little Congregation’ (Independent 2007), Play Stopped Rain (as ‘Stanley’ 2008) and Colliding With A Heartbeat (Mike Stanley 2010). The last five years I have been playing and recording under the moniker of ‘Hungry Survivors’. http://www.mikestanleymusic.com http://www.soundcloud.com/mike-stanley. Now, at 55, I am currently planning my next musical move-haha. Maybe a return to my noisier roots wouldn’t be such a bad idea. I’d love to play some gigs in the UK again. I hope that answers some of your questions Gary. Keep up the good work. Many thanks again for the insight Mike, with your permission I would like to include some of your words onto the website page as I’m sure others would also be interested. I wish you every success in your next musical move. Hi Gary. Sure. No worries. Take care. Mike.